From Vietnam To Vegas! 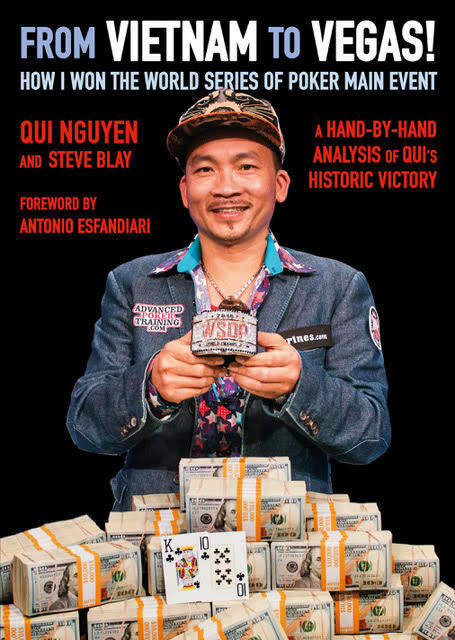 How I Won The World Series of Poker Main Event by Qui Nguyen and Steve Blay is now available. An extract from the book is available below. You can get your copy from D&B Poker publishing. 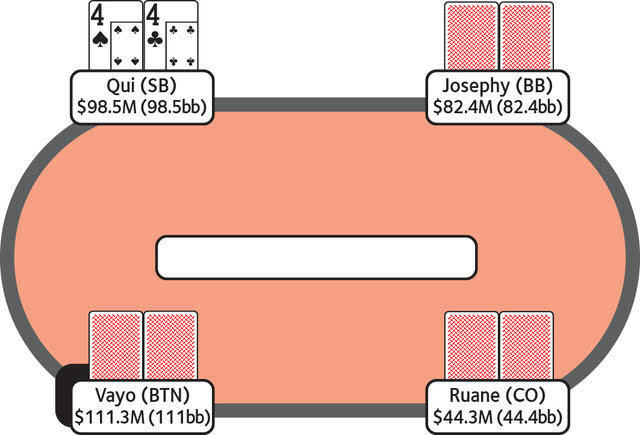 Gordon Vayo raised to $2.3 million from the button, and I called in the small blind with 4 4 . Cliff Josephy hesitated and thought for about 30 seconds. I looked at Cliff, and I was quite sure that he was not acting. He was genuinely considering whether to call or three-bet. Cliff made a large three-bet to 9 million, which made me think he was trying to get rid of us. Add to this the fact that this was a perfect situation for Cliff to make a squeeze play. He knows that Gordon, the original raiser, is risk-averse and is always looking to avoid confrontations. He is the player most likely to fold to a three-bet. Plus, since I just called Gordon’s initial raise, it is unlikely I have a very strong hand. When you are trying to get a read on someone, it is all about putting the pieces of the puzzle together. The evidence above made me almost certain that Cliff did not have a big pair. I trust my reads, always. When the action got back to me, I shipped all-in right away, to look strong. Cliff folded his A Q almost immediately. Antonio Esfandiari commented that the way I just called Gordon’s initial raise made it look like my hand is weak, and a small pocket pair would be my most common holding. That may be true, but does Cliff want a coin flip for his entire stack? Note that I could have made a smaller four-bet to, say, 25 million, but I still would have been virtually committed at that point, given Cliff’s stack size. The danger of making a smaller raise is that it gives Cliff the opportunity to go all-in, and then I might get stuck in a coin flip for 160 million chips. Or, he might call my four-bet, which is equally unpleasant. Then I am stuck playing pocket fours out of position on a four-bet flop. Not the kind of situation I want to be in. One final thing to say about this hand: I’m surprised that Gordon folded his 6 6 . This is a difference between us. As the chip leader, in position, I think he should be standing up to Cliff here, regardless of the fact that I am still to act behind him. Qui states above, “I looked at Cliff, and I was quite sure that he was not acting.” How? I asked Qui what he specifically saw that gave him this impression. He couldn’t tell me; he just knew subconsciously. You might find it worthwhile to look up the work of a Dutch Social Psy­chologist named Ap Dijksterhuis. A few of his favorite publications of mine are On Making the Right Choice, On the Benefits of Thinking Unconscious­ly, and A Theory of Unconscious Thought. He proposed his Unconscious Thought Theory (UTT), the gist of which is that when faced with complex decisions, humans make the right choice more often if they let their sub­conscious brain do the work. Your conscious brain works great when facing a simple decision. Let’s say you go to buy laundry detergent. Simple. You’ll probably check out the price, number of ounces, and some consumers might consider scent and whether it’s organic or not, those types of factors. The conscious brain can process all that, and you’ll probably walk out of the store relatively happy with your decision. Buying a new car is another story. There are just too many variables to consider, and the conscious brain gets flooded. Dijksterhuis found that consumers actually made better decisions when they allowed themselves to be distracted for a while (perhaps they took a quiet walk and didn’t think about the car), and then came back and chose the car based on instinct. It’s rather a frightening study for people like me who think they can solve everything by math and logic. Clearly math and logic are a large part of poker, but reading your opponents, taking in every aspect of their body language, comparing the nuances of their behavior to similar opponents you may have faced years ago, now that’s a complex problem, which has to be solved by the subconscious mind. I’m still in the process of formulating how best to apply this to poker, but the bottom line is: you’d better know your poker math, but you also need to be able to “let go” in certain situations and trust your instincts.